Chocolates, racing, and more chocolates! 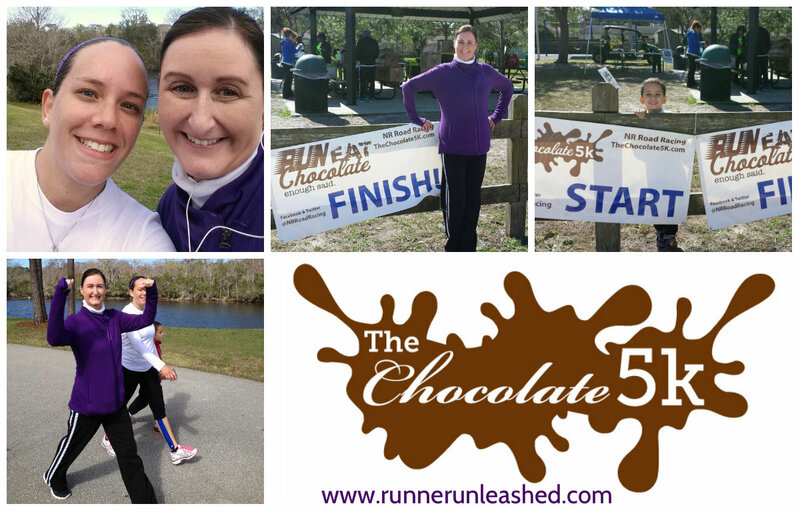 My name is Runner Unleashed, and I am a Choc-aholic! WOW! 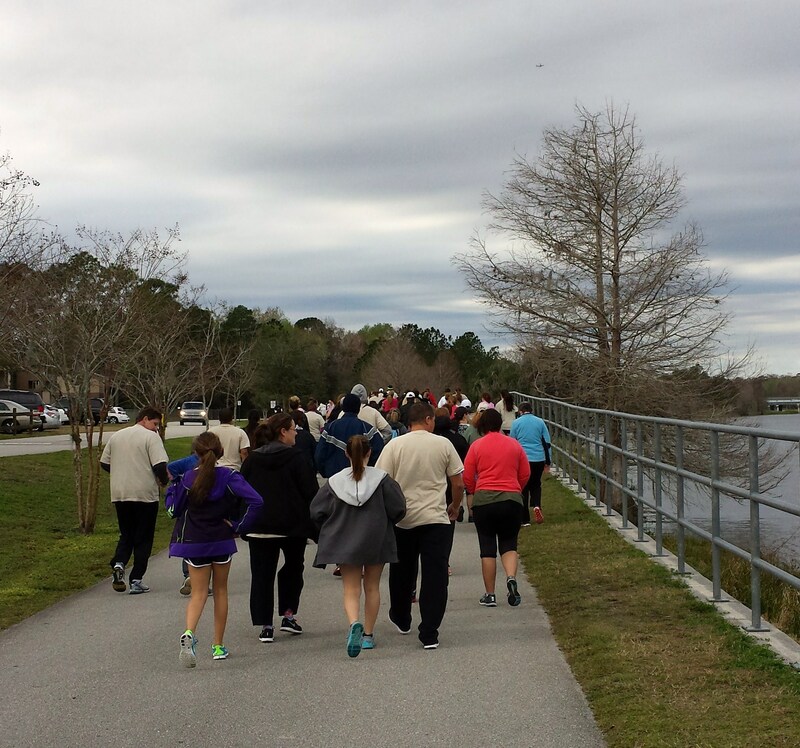 What an amazing race the Chocolate 5K was this morning! The race started at 10am but I waited for my friends to come meet up. The day started off real dark and grey. As we headed off to the race site, it started to rain a little, with a little cold breeze here and there and wasn’t pleasant. Since my cheetah cub was also participating in the race, I was a little worried that it would rain and he would be cold and wet. But of course, weather in Florida changes in minutes and that is exactly what happened. We went to packet pick up and hung around the start line until it was time for the race. 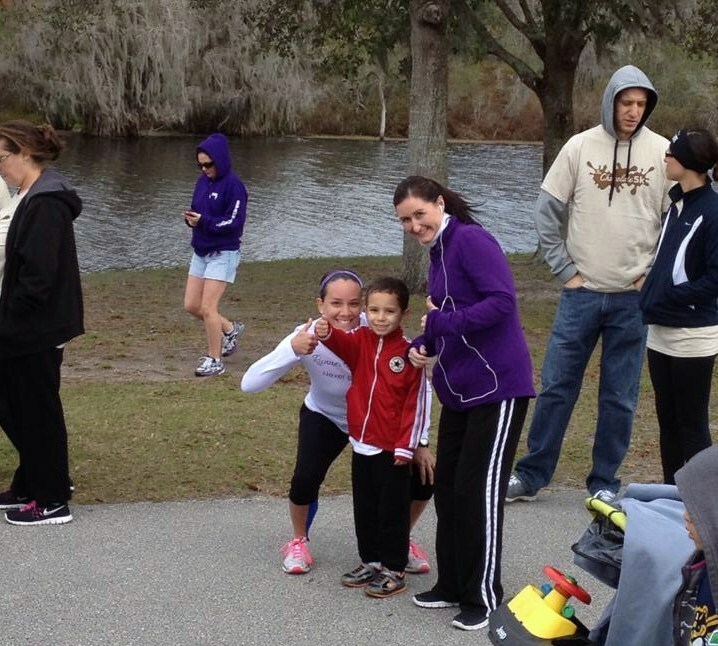 It was so awesome to see so many families gather together and run/walk. 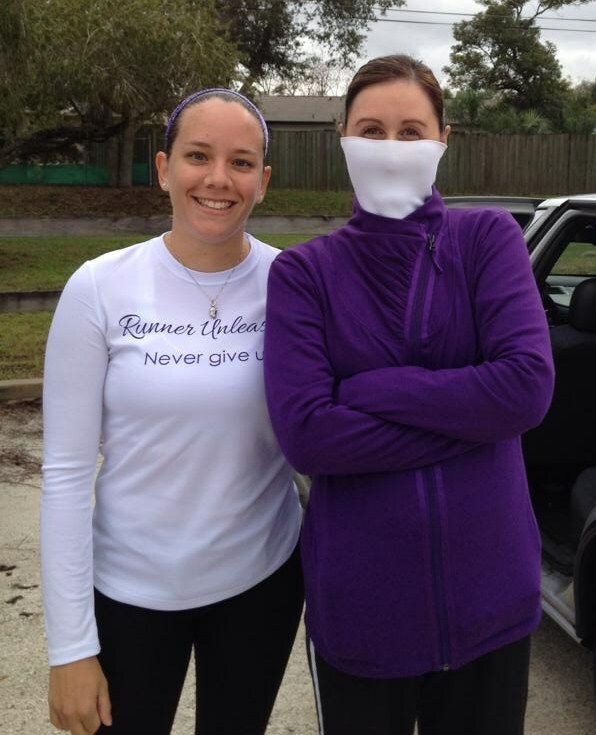 It was my friend, JoAnn’s first 5K so she was exciting to do this race. I was there to support her and cheer her on! We also did it with my son, which was his 2nd 5K and 5th race overall. It was time to race! And the weather was slowly turning for the better, getting sunny and warm. At the start line ready to go! Once it was time to go we were off. Glenn, JoAnn’s fiance who came to support his bride to be, stayed at the finish waiting for us to return. Once we were well into the race, I knew this race was going to change JoAnn. 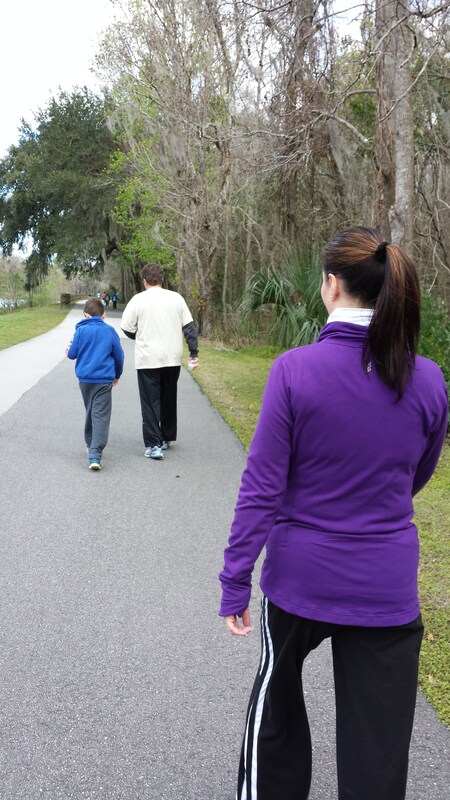 She has been on a long journey of overcoming weight loss and she never pictured herself doing a 5K. I was so happy when she approached me about doing a 5K, I told her I wouldn’t miss it for the world. I knew The Chocolate 5K would be PERFECT for her first 5K as it’s not timed, and many people walk it at their own pace. I was very familiar with the course already, as it took place where I run everyday. We were coming up on the first chocolate stop, we were ready for those delicious Ghiradelli chocolates! Another thing I loved about this race were the volunteers. They were a fun, enthusiastic bunch! I enjoyed passing them as they interacted with EVERYONE! It made it more enjoyable, so as always a BIG thanks to ALL the volunteers for being there. Almost getting close to the 1 mile mark, little man looks and me and says “Mami I am tired.” I told him “Oh no buddy we got to keep going! !” He had run a 5K race before, and has run 5K distances with us on that trail so I am not sure why he was telling me this, maybe just wasn’t his day . JoAnn and I kept going but he just plain stopped moving. 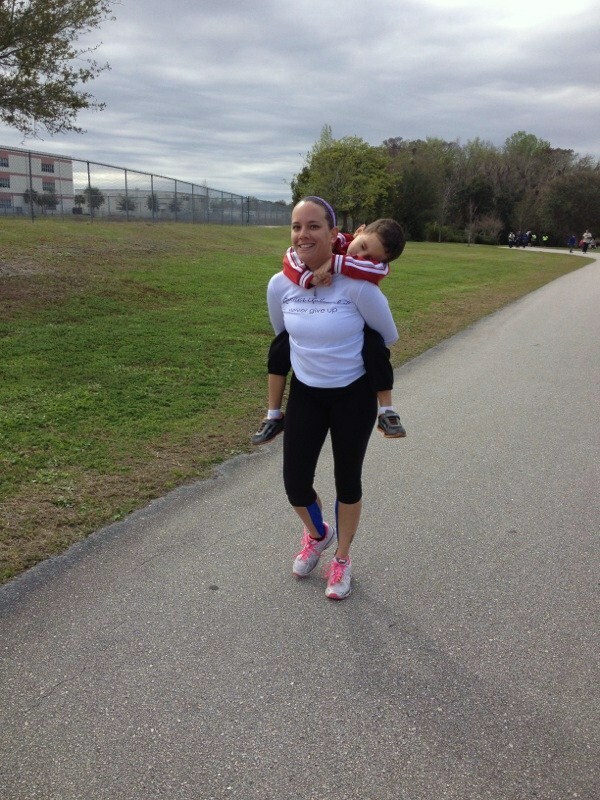 I knew I couldn’t let JoAnn down at her first 5K so I did what any other parent would do….right?? Cheetah mom carrying the cheetah cub the rest of the race. Passing racers on their way back was awesome, as they shouted words of encouragement as they passed us by. This definitely wasn’t a race to the finish getting 1st place, it was a race to enjoy the views, time with family and friends, and some CHOCOLATE! Once we made it past another chocolate stop and drank some water, we were on our way to the home stretch. JoAnn kept picking up her pace and walking faster, I knew she was determined, and she even beat her time! I kept telling her what pace she was at, I knew she will be successful because she has the determination gene! It was so awesome to see kids of all ages running and walking along side their parents. What a great example! I love seeing that! So many kids were having fun and all the adults ran with smiles on their faces. Could it be the chocolate? Who knows! Regardless EVERYONE had a good time. We were closer to the finish and the cheetah cub noticed so he got off my back, literally! UGH! I finally had relief my arms were shaking! I was tired and out of breath! We could hear the music and the noise of supporters at the finish line. I am glad they were there, as having that makes any race special. JoAnn was coming up to the finish line of her first 5K and she got tons of noise as she crossed that finish line!!! SUCCESS! The volunteers at the finish line were full of energy, singing and dancing making it a memorable moment when you got to the finish line. Everyone has a great time and stuck around to encourage and applaud those finishing. It was a great time and great chocolate! Overall, I TOTALLY 100% recommend you do The Chocolate 5K if it comes to a city near you!! It was a lot of fun, and a race everyone can do. Bring your kids in the strollers, scooters, roller blades. Get your girlfriends, mom, dad, brothers, and walk with them. The best part…CHOCOLATE!!!!! I am happy I got the opportunity to participate in this race and would do it again! They raised a lot for The Kerosene Lamp Foundation and glad I was a part of that! I love races that focus on raising funds for charities. Thank you NR Road Racing for putting on a fantastic event this morning! Lots of people participated and enjoyed the event! Thank you for all your hard work to making this event so enjoyable. Chocolate and running it is like my dream come true! It was awesome and delicious! Previous Previous post: Are you having problems with shin splints?? Next Next post: An ice wrap you don’t need to freeze?